Rock energy coexists with old-time mountain soul. Spooky backwoods melodies combine with hip hard-hitting beats. Raw, searing blues riffs intermingle with high heavenly vocals. 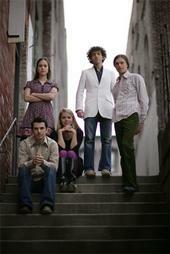 Crooked Still, the hot young alternative bluegrass group on a mission to bend the boundaries of traditional music. The unlikely combination of banjo, cello, and double-bass drives this low lonesome band, whose captivating vocals and high-wire solos have enraptured audiences all over North America and Ireland since 2001.